“Habib” came to be the title of the `Alawi Sayyids from the 11th Century onwards. Imam al-Haddad was born in Subayr near the city of Tarim in 1044 (1634). He went blind at the age of four but Allah blessed him with the light of inner sight. His father directed him to the pursuit of knowledge and he memorised the Qur’an and the foundational texts of the Islamic sciences at an early age. Among his teachers were Habib `Abdullah bin Ahmad Balfaqih and Habib `Umar ibn `Abd al-Rahman al-`Attas. He corresponded by letter with Habib Muhammad bin `Alawi al-Saqqaf, who lived in Makkah, and it was through him that the Imam received his opening. He continued in his studies until he reached the rank of mujtahid. His love of knowledge was accompanied with a love of worship. In his childhood, when his morning lessons had finished, he would perform up to 200 rakats of prayer in Masjid Ba `Alawi or other mosques. His day was structured around acts of worship, which began long before dawn and ended late at night, interspersed with lessons and time with his family. He compiled a number of litanies, the most famous being the Ratib and al-Wird al-Latif, which provide spiritual sustenance for the seeker. He had a great attachment to Surat Yā Sīn, which he read constantly and in which he was given a special opening. The supplication which he would make after it continues to be read widely, as do many of his litanies. He authored a number of books which continue to benefit people generation after generation. His works are clear and concise and thus suitable for our times. Several have been translated into English and other languages. He would dictate large sections of his books to his students without any preparation. The Imam’s longest work, al-Nasa’ih al-Diniyyah, contains the essence of Imam al-Ghazali’s Ihya’ `Ulum al-Din. In al-Da`wah al-Tammah (The Complete Call) he classifies society into eight categories and outlines each category’s rights and duties. Risalat al-Mu`awanah (The Book of Assistance), which he authored at the age of 26, is every Muslim’s manual of the path to Allah. Other works include The Lives of Man, Knowledge and Wisdom and Good Manners, all excellently translated by Dr Mostafa al-Badawi. Imam al-Haddad was involved in society at every level. He would write to the sultans warning them of their contravention of the Sacred Law and commanding them to repent and return to Allah. He also advised them in the affairs of government and mediated between conflicting tribes. He advised farmers on agricultural techniques and castigated the wealthy for not using their wealth to help the poor. He established the village of Hawi on the outskirts of Tarim which was self-sufficient and free from the meddling of the rulers of the time – close enough to receive the good of Tarim but far enough away to be safe from the conflict and sedition that plagued the city. The mosque which he built there, Masjid al-Fath, and his house have now been greatly renovated and receive many visitors. He would supervise and fund the raising of orphans in his house and, in spite of his blindness, would take part in the work of the house, feeding the animals and sealing the water vessels. One of the sultans of India wished to honour him by sending a ship laden with gold but the Imam knew that the arrival of this wealth would have negative effects on Hadramawt and its people. He asked Allah to make the ship sink and that everyone aboard would be saved, which duly happened. He was in a state of constant presence with Allah, which led him to say to his students at times: “Do not ask me too many questions for I have to expend great efforts to focus my attention on you.” Not wishing for anyone to detract from his focus on his Lord, he instructed people not to approach when he was going to out to the mosque for prayer. On one occasion he said “Allahu akbar” upon entering the prayer with such force that the wall of the mihrab in front of him split. The crack remained in the wall until the recent refurbishment of the mosque. His constant supplication was to perfect his following of the Messenger of Allah ﷺ. In his old age he grew his hair long, saying: “There is not a sunnah that was prescribed by the Prophet ﷺexcept that I hope I have acted upon it.” He said that if he was in doubt over the authenticity of a hadith, he would refer directly to the Prophet ﷺ. It is little surprise that the Imam came to be regarded as the “renewer” (mujaddid) of the 12th Islamic Century. 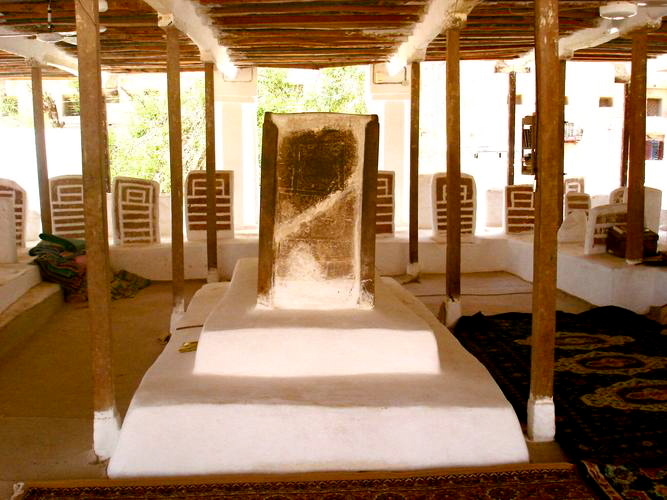 He died in al-Hawi on 7th Dhu’l-Qa`dah 1132 (1719) and was buried in the Zanbal Graveyard in Tarim. He (may Allah be pleased with him) left behind six sons – Hasan (who became his spiritual heir), Husayn, `Alawi, Salim, Zayn, Muhammad; and four daughters – `A’ishah, Salma, Fatimah, and Bahiyyah. His students were giants in their own right: amongst them Habib Ahmad bin Zayn al-Habashi, Habib `Abd al-Rahman bin `Abdullah Balfaqih, Habib `Umar bin `Abd al- Rahman al-Barr and Habib Muhammad bin Zayn bin Sumayt. 1 For the full story and for a more detailed biography of the Imam, see Sufi Sage of Arabia, Mostafa al-Badawi. 2 Meaning that the greatness of this poem in Allah’s sight would have been a means to attaining His mercy and forgiveness. However, the Imam preferred to rely completely on Allah’s generosity and meet Him with nothing.